5-1/2" tall x 5-1/2" wide. Bunny on one side and carrots, flowers on the other. So cute on any counter top! 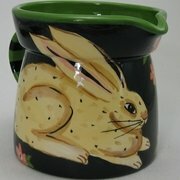 For Rabbit lovers, this Bunny is a must!